First question: Do you think Laveen should be split into more that one city council district? That's the current plan, based on the final proposed maps from the city's consultants. Second question: If Laveen is split into more than one council district, which parts should go where? There was one map in the initial proposals that had a somewhat objectionable vertical split, dividing Laveen from east to west. Then there was a map that divided Laveen from north to south, more or less along Baseline, as I recall. The city's current plan seems to have borrowed from both, but definitely has a stronger north-south split. Third question: If Laveen is kept whole, which other areas of Phoenix should end up in the same district? And here we are, approaching the end of 2013, with Michael Nowakowski still serving in District 7 and newly elected Kate Gallego prepared to soon take office in District 8. Laveen has never had more direct advocacy on the city council, given that these two community leaders both live in or near Laveen and are involved in the community. However, this also raises the question of how Laveen is or should be divided. 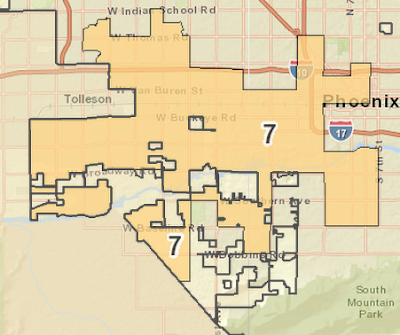 I feel particularly attuned to this issue, given that I recently moved from "Laveen District 7" to "SoMo District 8". The same folks who gave me grief for my audacious concern for Laveen from the north side of Baseline continued giving me grief after I joined them in their council district but left the village of Laveen (and somehow remained concerned about Laveen). Not only did I join the lower density south-of-Baseline folks, but I also moved into the true "South Phoenix" -- certainly a controversial name for our part of town in some circles. But then this evokes the notion that Laveen and the old South Phoenix are now more inextricably linked than ever. In fact, I even wrote a south Phoenix post in 2011, right before moving a few miles eastward, that still reflects how I feel about this topic. And here's the follow-up collaborative blog post with NPR's Nick Blumberg, with audio included. I still maintain that I feel more connected to the old Laveen (Laveen 1.0) now than I did as a resident of the new Laveen (Laveen 2.0). I'm now anxious to see how the new-new Laveen (Laveen 2.1) evolves in light of this shift in political power and growth for the area. But that again evokes divisive terminology, just as high-density and low-density does. Given our area's glorious diversity, there seem to be endless opportunities to divide our community on any number of criteria... or unite for the common good. Good luck to Kate and Michael, who I trust to continue drawing on the area's strength in diversity and opportunities for future growth. I wrote a post a few weeks ago that I knew would be contentious, but did not anticipate the level of divisiveness that it fueled. It was titled "Laveen's Delicate State of Housing, Density, and Growth". What's so delicate, you might ask? Well, aside from the obvious point that we are still in the midst of the housing recovery (and it has slowed drastically in recent months), there are many issues in which I see Laveen precariously divided and without a properly up-to-date strategy going forward. This division became clearer in watching the videos from the October 30th city council meeting (here and here), at which many Laveen residents spoke both in favor of and against Butler Housing's plan for a slightly denser housing development at 43rd and Baseline (and yes that's me, very dressed down for a formal meeting, but it was a rather stressful day of going back and forth from the hospital and other commitments). 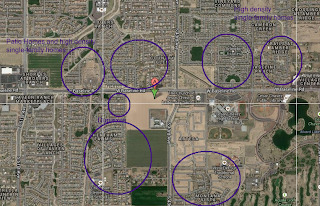 So let's look at some of these issues as discussed and/or alluded to in the last few months and explore how they might hint at a shift not only from Laveen 1.0 (low-density, agricultural) to Laveen 2.0 (more suburban, with mostly low- to medium-density tract housing and neighborhood retail), but now to Laveen 2.1, which I think is a fitting name for the revised plan that we should envision after having experienced a full cycle in the housing market over the last decade. I get it, some folks don't like density. I once was on your side -- remember, I supported the legal battle against Berkana. I also fought the apartments planned for 35th Ave. and Southern. The memory of these past battles made me want to look back and reflect on what has changed since then, either about Laveen or my perspective. Here's a blog post that I wrote five years ago about the fight against apartments near Wal-Mart, which I'm glad I found. To this day I am concerned about the quality of development that we will see on that site if it ever gets developed. The high density only helps to facilitate and contribute to low-quality development at such a location in my opinion (although I suppose there's a chance that it could become affordable senior housing, which is pretty inoffensive and a popular, much needed multifamily product at present, as discussed in my last post). This is a separate issue from the site at 43rd and Baseline, largely due to the difference in surrounding amenities. This brings me back to the overall tone of our discussion on density. Not only has my perspective on appropriate placement and levels of density evolved; not only has the execution of Laveen's overall plan evolved; but there was something else that made me want to jump into the fray on this issue. It was that I picked up on a darker, more insidious element to the anti-density argument. The Laveen faction that most opposed the density on this site seemed to most prominently feature the voices of those who bought larger homes on larger lots in newer subdivisions. These homes are now, for all intents and purposes, regarded as "low density" (although many folks who live on Laveen's rare remaining acreage in the area might call it something more of a "compromise"). In their arguments against density, I detected this precariously qualified notion that they don't hate all density, but they certainly hate it to south of Baseline if a project wasn't previously zoned for higher density. This realization made me question what was so inherently bad about density -- particularly in this location, near where I once bought my own home on a 5,500 square foot lot. Were they blaming homebuyers like me for Laveen's growth-related challenges, while escaping blame themselves? I cannot find a justification for this line of reasoning in the city's most recent annual heat maps of criminal activity, nor could I find justification in analyzing rental rates in newer subdivisions and I made this case in my previous blog post. Therefore, I could not bring myself to oppose the density on these bases or any others. There were many more, too numerous to list, as well as the trend toward "Traditional Neighborhood Development" that took root in these places and others -- especially suburban growth areas that feature quaint walkable town centers (or even neighborhoods that offer a neat mix of uses). For a great regional example of a truly traditional neighborhood, I'd offer downtown Prescott, AZ, which is often held up as exemplary urban design. However, I can't help but note that downtown Prescott developed largely organically, on its own, in a very different time before the days of zoning and it started with density at the town center (newer growth in Prescott is an abomination to the city's original charm, IMO). Conversely, all of those above named places feature some sort of justifiably powerful centralized planning control (not to mention a great deal of economic resources), which allowed the artificial co-development of high density and low density for their own manifest destinies. Guess what Laveen lacks: centralized control and clarity of vision. Not only must Laveen struggle with the modern execution of Phoenix's urban village concept, but we tend to erode the legitimacy of Laveen 2.0 with each inappropriate compromise that we allow and each smart compromise that we block (like our Wal-Mart apartments versus smarter SFR layouts near quality amenities). In every such controversy over compromise, we find this vocal minority talking about the prescribed density that we can live with -- density at the future village core, to be located between Baseline and Dobbins along 59th Ave. (see 2002 general plan here). Remember that this is the same density that was shoved down Laveen 1.0's throat a decade before most of our development started. I'll go into Laveen's overall "feel" in another post, but end this one on a note that the above argument is misguided, possibly even spurious, based in part on our perception of what Laveen is and can be. The anti-density crowd holds onto its false belief that Laveen 2.0 remains "rural", while also rejecting the apparent truth that people tend to move to Laveen seeking housing value. To take it a step further, one of the parties fighting new density in Laveen cited a bit of smart-sounding research about current trends toward higher density mixed-use development (see here, here, and here), but falsely rejected that it matters to Laveen. Note that millenials and aging baby boomers are largely credited with leading these shifts away from the typically suburban toward more urban neighborhoods. When I ran an analysis of Laveen's demographics and community "tapestry" on esri.com, I confirmed that our population has experienced a sea change from "Green Acres" (Laveen 1.0) to "Up and Coming Families" (Laveen 2.0), with additional changes anticipated for the years since the 2010 census information was cited. Laveen does, after all, offer the closest swath of new housing to downtown and the airport, which differentiates the area from other such suburban locales in our metro housing market. Moving forward, I find it increasingly difficult to toe the line on our expectations for a glorious village center that only makes sense once our embattled Loop 202 South Mountain Freeway gets formal approval. If we seek to preserve that plan, then I propose that we hold firmly against low-density suburban development in the target area, which hasn't been an issue (yet). But to oppose good density elsewhere looks foolish and backwards, especially when Laveen 2.0 is but one interpretation of an ideal balance between high and low density, and it's long overdue for an update. We can and should do better than our already corrupted Laveen 2.0 plan as we move forward, and one such way that we can do that is to squeeze increased density and positive flow closer to fun open spaces as a means to amplify that very benefit that we all agree is most critical to Laveen -- open space. Here's a wonderful article that might just blow your mind if you opposed the project at 43rd and Baseline: "Using urban density to support parks, and vice versa". 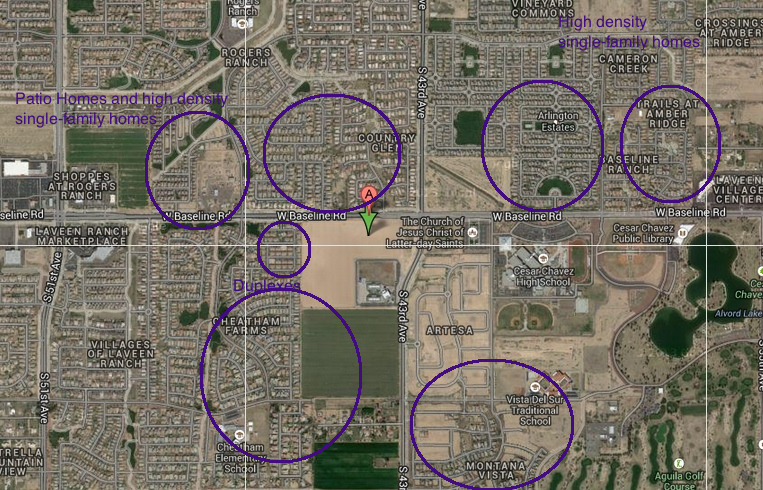 There are a few more home-based facilities scattered around the area, mostly toward the east of Laveen (as are those three above) and some places downtown. 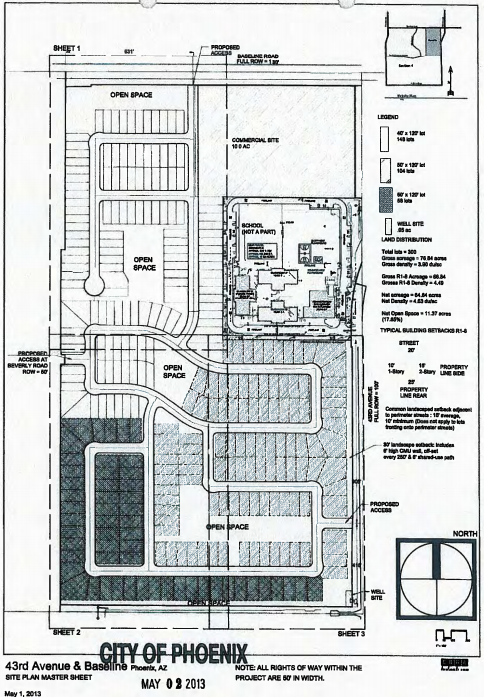 There is a plan to bring senior/assisted living to the NWC of 51st Ave. and Baseline (you know, supposedly "farm" land, where crops all too often go to die so that the owner can keep a low tax basis on vacant land -- no offense, but that's how it appears). I would strongly support this property owner's efforts if it means bringing more activity and resources to this intersection soon. That said, I remain skeptical yet hopeful after having watched this site for the last eight-plus years sitting in waiting for a developer. Now that they are working on entitlements with the city, however, there must be hope after all. That's a total of 90,533 people in these two ZIP codes (for comparison's sake, the city of Goodyear has a total population of 65,275). Of those 90,000 residents, 11,856 (13%) are 55+ and another 31,066 (34%) are in the 30-54 age group. This means that there's a total market of almost 12,000 residents who may soon be looking at retirement options that might include senior housing, plus another 31,000 who may need nearby senior housing options for their parents in the next two decades (or themselves later). I don't work in this industry, nor have I ever, but I did once work with some smart folks who develop senior housing throughout the country. From what I understood of their business model, this might just be an opportunity worth pursuing further based solely on the numbers. I was actually rather fascinated by their development strategy, as it aligned closely with the interests that I represented at the time (hence why we were talking) and, if done right, follows demand like clockwork -- for a lucrative business model that also serves as a valuable amenity to the communities where they build. Imagine my surprise when I learned from Wayne Rainey, owner of monOrchid (where I was married, btw), that he had teamed up with the already familiar Reid Butler to build an interesting mixed-use development on the city-owned site adjacent to monOrchid, but that another project appeared to be winning: a low-income senior housing project. This is in the heart of Roosevelt Row, downtown, where I'd least expect to see senior housing as a preferred development type. So of course it piqued my curiosity, and it turns out that I'm not the only one. The AZ Republic editorial board chimed in with its column, Let’s get this downtown Phoenix project right; and the Downtown Devil reported on the story as well: ECCA meeting focuses on proposals for historic Knipe House and nearby properties. 1) Senior housing and assisted living facilities are still in demand as the baby boomer generation continues shifting toward retirement. 2) Affordable senior housing is particularly needed. 3) Ask any major senior housing developer about their strategy, and they will tell you that they generally prefer locations surrounded by and/or accessible to large residential neighborhoods that are not yet adequately served, as most people looking at such an option seek as minimal a life change as possible and want to remain near their families/friends. 4) Affordable senior housing is easier to finance than other product types, thanks often in part to tax incentives, but also largely due to special HUD financing. 1) Part of what everyone wants (or says they want) is residential diversity downtown. 2) Downtown Phoenix is one of the least densely populated areas of our entire metro housing market. 3) Downtown Phoenix needs more full-time residents in order to continue attracting residential amenities to the area, thus improving quality of life for current/future residents and fortifying the regional appeal for the area by breathing more life into it. 4) A vast majority of people who work and/or attend school downtown commute to the area. When exploring from a blank slate what is most needed downtown, I would recommend looking into current ratios of senior housing (particularly affordable senior housing) downtown as compared to other parts of Phoenix. Sure it will likely run a little bit higher, but this seems like a valid test of need for this targeted development type in this location and my guess is that the need will not be demonstrated by a comparative analysis. Next, given that the city owns this site and is essentially serving as the invisible hand of the market, I'd ask what the market will most likely produce without the help of the city. My guess is that affordable senior and student housing will win this battle, thanks largely to the already available special HUD financing and back-end investment demand for these product types. And finally, what segment remains under-served in the subject area? Sure there are the artists, but I'd also suggest that there's a sizable enough segment of the downtown workforce population that would prefer to live downtown if they had better options. What about them? Isn't it in the city's best economic interest to nudge this segment along every once in a while if it means increased competitiveness for attraction of high-wage employers? As a side benefit, it would also help reduce traffic/commuting costs elsewhere in the city. Most of these questions/suggestions could be much better supported with data that should be gathered and analyzed, and I simply don't have the time right now. But my gut tells me that we don't need the affordable senior housing on this site and I don't think that's an unkind sentiment at all. I just don't see how the city as a whole or this neighborhood in particular benefit by concentrating so much senior housing in this particular area. Let's start with a big kudos for the generally positive and concerned tone with which the community responded to awful news of a shooting that occurred on Saturday night on our turf, in which an innocent young woman was murdered. Now how about a brief moment of silence for the victim Nora Osman -- may she rest in peace and may her family and friends find the justice they deserve for such a tragic loss. As is too often the case in such situations, the internet tends to erupt with horribly vitriolic commentary that does nothing to help; I am grateful that our community FB group refrained from engaging in the vitriol this time around, despite coming close. As has been the case in the past, news unfolded almost in real time, with neighbors updating the group and seeking additional information after calling police about the mayhem unfolding around them. It brought back a rather vivid memory of when I experienced something similar back in 2007-2008. I remember feeling back then that my peaceful community had been victimized; it angered and concerned me, and it served as a catalyst for meeting as many of my neighbors as possible and starting a block watch. In our case, no one was killed, but it most certainly left scars and left us asking, are we still safe here? So let's get right past the question of whether geography matters -- it does not, as is often pointed out rather quickly in these cases. This is not common and I refuse to accept that it might become common in Laveen or anywhere else. The frightening truth is that this probably could have happened almost anywhere. Bad guys with guns showed up to a party that got out of control, and they shot people. We still don't know who they are or how close police are to catching them, but we blame them and no one else. So how did the party get out of control? According to the neighbor who reported this to our FB group, a couple of neighbor kids knocked on her door earlier in the evening (at their parents' request), and asked if loud music would be ok. I can't help but again put myself in that neighbor's shoes and think, "Wow, these kids are considerate!" Nothing could go wrong, right? But it did go wrong, very wrong, and it happened somewhere outside of the neighbor's house party on the street, sometime around 11:00 PM. According to the neighbor, shots were fired and "kids" were running through her front yard trying to hide. Then the police showed up as the "kids" scattered ("kids" is in quotes because it sounds like they were mostly young adults). Prior to this turn of events, it sounds like there was nothing to indicate a problem. Details are still emerging and the police are still investigating. Concerned community members likewise sprung to action -- some of us started immediately investigating upon hearing that it was a young woman who died, in part because the news media were not yet reporting this information and we couldn't help but want to learn more. My first thought was to visit her facebook profile (now inactive/blocked) to see what was written there. Sure enough, the RIP messages supported our guess that it was indeed Nora Osman. I then checked some of her contacts who had recently posted on her profile. From there I found a troubling post by someone who looked like a current/past boyfriend and a few other disturbing comments/images from others (for instance, a young woman kissing a pistol and her friends commenting on her "thug" style) -- but nothing that made me think that the victim might have brought on any sort of violence to herself. In fact, when I checked her twitter, instagram, and ask.fm social media accounts, I was touched to read the following assessment of where she thought she would be in ten years: "Married doctor kids big house for my mama nd siblings" [sic] is what she said. Sadly that will not happen now because someone murdered her in the street, in an otherwise safe neighborhood. I may have already invested too much effort looking into something that is ostensibly none of my business, but I sincerely feel that we owe it to our each other to get concerned. As one member of the FB group commented, this kind of violent crime has become too common in recent years. This is not a comparative statement, warranting the obvious correction that we experience relatively low crime in Laveen when looking at the entire city's crime rates, but an absolute one. We do need to own up to the recent increase in gun violence and make it go away -- not by calling people names, trying to blame entire categories of residents (new vs old, rent vs own, and similar), but by doing whatever we can to help. As MLK famously observed: "Darkness cannot drive out darkness; only light can do that. Hate cannot drive out hate; only love can do that." In this spirit, I say do whatever you can. Some have suggested that residents attend the monthly "Coffee with a Cop" event, others call for greater vigilance overall, but I'll suggest an ever so slightly different angle: Do those things if you can or are so inclined, but mostly just get to know your neighbors and care enough to be a little bit nosey. Saying hi to fellow community members and recognizing their faces enough to do so tends to help the rest naturally fall into place. Let's also remember to consistently reject the glorification of violence -- I'm sure we'll eventually learn that the suspects were young men proudly "thugging" or (gang) "banging" or similar. While it would be ridiculous to blame anyone but the shooter(s), I believe that our community can learn from this event, come together a little closer than we have been recently, and just maybe prevent the next tragedy from occurring. We owe it to Nora to try. If you're keeping track, here was part one of this series, about the Sachs-Webster House on Baseline. Today let's look at a really cool, if not very well known, annual tradition in our community. It is the Pioneer Luncheon, happening today, and it honors those who have lived in the south Phoenix area for at least 50 years. Judging from this past article about the 37th annual luncheon that was sponsored by Lowman's Funeral Home in 2011, it must be the 39th this year. Having heard stories from one of my neighbors about the good ol' days of getting together with all of his friends at the no longer existent bar next to Del Monte Market (near Laveen in SoMo Village, at 27th and Dobbins), this is a group with which I'd love to break bread someday. Therefore, I'll have to keep an eye out for it next year, as all are welcome to attend (but us newbies must bring a donation of some sort). And in case you didn't bother to follow the above link to the South Mountain Villager article, I'll post it again so that you too might get excited about catching this event in the future: http://southmountainvillager.net/tag/pioneer-luncheon. Hope to see you there! That ain't been there before. This was the motivation I needed to write a post about ways in which Laveen residents can get more involved. Contrary to some of the often inadvertently judgmental pleas that I've seen recently in our Laveen FB group to "show up to public meetings or forever remain silent" on community issues, I'm going out on a limb to suggest that there are plenty of valid but often ignored opportunities to contribute. And they don't necessarily involve attending "boring" meetings, although that certainly helps sometimes (and the troopers who do it sometimes need a break). So let's try and explore those options. First, are you an artist (of visual media)? If so, you could have stopped at the first line of the above poem and moved on to the Laveen Art League (and you probably did). If performance art is more your style, how about coordinating with LAL or setting something up with the Laveen Stage (open mic night), Tempe Dance West, or someone else in the community? There are plenty of opportunities that are already somewhat structured, and I bet you could get creative and do something totally different: flash mob, random public art installation, or otherwise. The possibilities are endless, and society relies upon you creative types to push the boundaries of what we previously thought were the limits. Are you a shopaholic, foodie, or otherwise love a good excuse to go out and patronize local businesses with fellow community members? Then check out the Laveen Farmers Market, Laveen Cash Mob, or similar. Are you the active type? If so, I recommend the "Laveen Isn't Lazy" Activities Group. Aspiring crime fighter or otherwise concerned about safety and neighborhood security? Try the Laveen Village Blockwatch and PNP (logical prerequisite: get involved with your neighborhood block watch too). Eh, maybe you are the type that goes for boring meetings.... I know you're out there because I'm one of you. There are a variety of options and I've tried many of them myself. Remember my post in 2011 about my unfortunately successful run for the HOA board? Yeah, I'm still on my HOA board until at least next year, even though I don't live there any longer.... If I weren't on the board, I'm sure I'd still be involved in HOA matters because the HOA exists and it represents me whether I like it or not. That said, the HOA exists for owners and not necessarily for residents -- an important if sometimes frustrating distinction. Therefore, I like looking for other opportunities to get involved with neighbors, like starting a neighborhood association, block watch, or simply holding informal and unofficial neighborhood picnics/BBQs. When I lived in and served on my HOA, we merged these two worlds by attempting to forge community bonds in line with the HOA mission of maintaining and preserving our subdivision. That said, I'm not really much of an HOA guy. If you are into HOAs (and I mean really into HOAs), then you can take it a step further by getting involved with LAHOA, which is the Laveen Association of HOAs. I jumped on-board when LAHOA first began because it spoke to the "New Laveen" subdivision-dweller in me and offered an opportunity to launch an economic development initiative that focused on attracting businesses to Laveen -- one of my passions that didn't have much of an outlet elsewhere. After a year or two, I realized that I didn't particularly care to remain involved with LAHOA and couldn't commit the time anyhow. The same thing happened when I tried getting involved with the more "Old Laveen" group, the Laveen Community Council, which has done more than most other groups in Laveen to support the community. The LCC is a great organization, but more appropriate for those of you who are into planning fundraisers and coordinating with schools, churches, and such (speaking of which, there are plenty of opportunities in those places too). I wasn't really cut out for the LCC, but if you are then please get involved there. What I finally found that appealed to me in my search were the planning and development focused groups. The LPC/LCRD is a volunteer group that meets monthly to discuss county/city development issues in Laveen and often contributes to the discussion at meetings of the Laveen Village Planning Committee (LVPC) and elsewhere. I enjoyed serving my time on the LVPC and elsewhere for the city, as it offered insight and a platform to speak on forthcoming developments in Laveen. If this is where you too enjoy participating in the community dialog, then I recommend getting involved there. Or, you know, maybe none of those options seem particularly inviting or attractive to you. That's fine. It should be obvious here that I've found more reward over the years in my overlapping blogging/facebooking activity that complemented my other community involvement. You might consider these avenues valid/valuable or not, and you may or may not engage with me in these forums. That's fine. However, I tend to disagree if you knock it because at least it's something and, as has been noted previously, the dialog can be imported or exported from these various avenues of discussion as needed. So I love a general appeal to "Put Something In". What's your something? If you haven't found it yet, then I say keep looking. Just try not to be negative about others' choices of how they choose to engage in the community dialog; we do not need that. This site plan for a new subdivision at the corner of Baseline and 43rd is causing quite a stir, depending on your social circle. 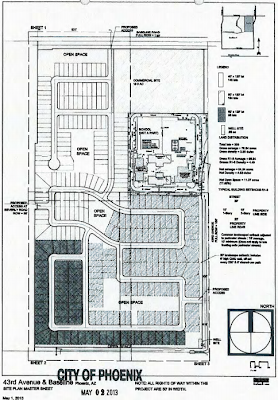 This site plan is otherwise known as Case # Z-152-03-7(8) in the city of Phoenix's planning department. There is a rather vocal group of Laveen residents headed to the Phoenix City Council meeting this Wednesday, October 30, 2013, at 3:00 PM, to oppose this site plan (agenda item 74, in case you're interested). For the record, I spoke at the PHO hearing a couple months ago, partially in favor of this project and partially opposed to it. I really can't decide if I'm energized enough about this to attend the upcoming council meeting. And here's why: What I hear being described as the most contentious part of this site plan is the housing density (we're still talking single family, here). Firstly, I don't mind higher density single-family homes. I own a home very close to this property, where my family and I once lived. We intentionally bought small and wanted to be situated between the shopping centers at 51st Avenue and Baseline and the beautiful park/school/library complex at 39th Avenue and Baseline. That brings me to a related point, which is that I think there should be more density in such an area as this. And further, when I think about density in this area, the first thing that comes to mind is the 80-unit community of duplexes that already sits directly adjacent to the subject property, known as Vistas Montanas (a part of the Cheatham Farms subdivision). Here's a list of the communities by name, as well as the total number and percentage of lots in each that are less than 6,000 square feet -- generally an agreeable cutoff size for small versus medium residential lots. The total number is 2,081 in the surrounding subdivisions. The total number of residential lots under 6,000 square feet in all of Laveen (85339 only) is approximately 3,633, which means that they tend to be concentrated in this area. This makes sense to me, given those amenities that I already mentioned and the common sense notion that we should want to concentrate populations nearest shared amenities like parks, schools, libraries, and such. But it doesn't make sense when I hear my friends who are opposed to this project say that the density was never supposed to go here and that the general plan is the holy grail. Oh how I want to agree.... I too have fought in favor of the general plan as a static instrument in the past.... But I can't. I sincerely think the GP could use an update -- in part because of this very area and this contentious issue! Remember a few years ago when we fought Berkana? That turned into a pyrrhic victory if ever there was one! We fought density at 27th Avenue and Baseline only to find out a few years later that Valley Metro was moving forward with a transit facility at the same intersection. Generally speaking, transit = density (or it should, anyway). While that experience made me feel a little disheartened by the process of challenging proposals such as this one, it also forced me to reconsider what I think are the most important concerns related to city planning and when we should intervene in the planning process on someone else's private property. Should we be concerned about small lots, small houses, cheap houses, or any of that stuff? That's what I wanted to know, and particularly with regard to this area. This means it's time to test some assumptions, starting with density. One claim that I've heard is that higher density means more rentals, but then we could say the same about smaller homes and cheaper homes -- the latter two being set aside momentarily by the builders' claims that they plan on building market-priced average sized homes on these smaller lots. Whether you think rentals are good or bad for a neighborhood probably depends on your perspective, but it's sort of a foregone conclusion in this debate. Of all lots that are less than 6,000 sq ft, 1,497 or 41.2% are rentals. Of all lots that are at least 6,000 sq ft, 1,854 or 27.8% are rentals. Of all homes that are less than 2,200 sq ft, 2,113 or 36.9% are rentals. Of all homes that are at least 2,200 sq ft, 1,238 or 27% are rentals. Of all homes that sold for less than $180,000, 2,742 or 38.6% are rentals. Of all homes sold for at least $180,000, 599 or 18.9% are rentals. *2,200 sq ft and $180,000 were selected as dividing lines based on the recent average size and price of homes sold in Laveen. From what I can tell based on that information -- and if there are any statisticians who disagree, please let me know -- it looks like price is a better indicator for whether properties will likely become rentals. Only a multiple regression analysis would likely indicate the strength of any one variable, but this makes sense to me based on common sense. So what if "we" lose the battle for low density, which in my mind amounts to a spurious concern for this particular area based on the information above. Why not focus on something else, like the quality of construction, that directly influences the builder's bottom line and can more meaningfully impact the surrounding community? After all, this is the excuse given for why we don't mind the adjacent duplexes -- "But they're pretty nice!" we say. This is also how we agreed to let another developer adjust its site plans to allow patio homes as a part of the planned Carver Mountain subdivision -- they look like they'll be beautiful (and I'm a fan of patio homes in many cases). This is why I maintain that this fight ought to be about the characteristics of the construction, specifically the 4-sided architectural focus and other elements of landscaping and overall design that are mentioned in the approved stipulations. According to MLS data as of today, of all the homes built and sold since 2011, the average size is 1,980 sq ft, average sale price is $180,630, and the average price per sq ft is $92.35. Pending listings have jumped to an average sale price of $222,650, based on an average increase in size to 2,107 sq ft and an average listed price per sq ft of $106.43. You can see that the active listing numbers have slipped a little bit for Laveen on a slight reduction in the listed price per sq ft to $99.73. It makes sense based on the fact that the Cromford Report shows Laveen having already entered "balanced" territory as of early this month, with a contract ratio of 102 (down from 191 last quarter) -- meaning that demand has slowed and fewer new listings are being sold as quickly (note the increased days on market). After the last couple of years, this should be expected; buyers tend to seek value in Laveen. Home values have increased dramatically during the almost seemingly savage pricing recovery that we've enjoyed, thanks in large part to those controversial institutional investor purchases in the last year. This is likely to scare away some buyers temporarily, as mortgage rates have increased over the same period and negatively impacted housing affordability. 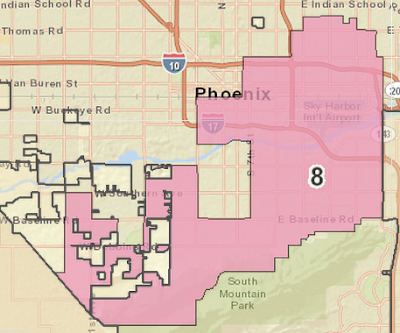 Another indicator that I like to use when looking at Laveen for contextual market performance is to compare it to the nearby 85042 ZIP code, located slightly east of Laveen in South Mountain Village. As has been the norm lately, 85339 lags 85042 by about 30% in price per sq. foot. That said, the recent monthly median price of $172K (as reported by Cromford for October 1st) is identical between the two ZIP codes, which further validates the value-seeking motive behind sales in the 85339 ZIP code. As does the fact that more resale transactions are still happening in Laveen, as distressed inventory continues getting bought up. This looks to me like a generally healthy point for the market to take traction -- especially considering that Laveen's sales activity, more than other areas, has temporarily slowed as cash investors have started disappearing from the Phoenix market. The fact that buyers once again have some negotiating power, as reported here, likely bodes well for a continued housing recovery. So please do not be afraid of density, Laveen -- at least not for density's sake when we're comparing similar new subdivisions of single-family homes. None of these are really comparable to the "old Laveen" that consists of ranch ramblers and lush green open spaces. If you want to talk about Laveen's rural character, that's a different discussion -- one that is very worthwhile, as Laveen faces something of an identity crisis in light of future development plans. One thing is certain: We are not seeing any indicator of a trend away from new HOA developments, which tend to be far more similar within the subset of newer communities than when compared with the older low-density neighborhoods in Laveen. And that ship has sailed anyhow -- most large tracts of farm land in Laveen are already platted for new subdivisions, some with different characteristics than others, but still very different than what you see now when you drive down the older neighborhood streets in Laveen. By going to battle over slight modifications to these plans, we're looking at the potential for little more than another pyrrhic victory. 10/31/2013 Update: The Laveen residents who opposed this developer have won their case, on a council vote of 7-1.